Computer Animation Primer: Photo 8.3, Screen photo of Jawbreakers., page 332. (Copyright@ 1981 by On-Line Systems.). Photo 9.1, Stereoscopic cube by Joe Vierra (see color insert. ), page 341. (Courtesy of Joe Vierra.). Photo 9.4a, Screen photos of the Great Movie Cartoon., page 383.. Photo 9.4b, Screen photos of the Great Movie Cartoon., page 384.. Photo 9.4c, Screen photos of the Great Movie Cartoon., page 384.. Photo 9.4d, Screen photos of the Great Movie Cartoon., page 384.. Photo 9.6a, Screen photos of The Adventures of Farnsworth., page 389. (Copyright@ 1982 by Gebelli Software. Inc.). Photo 9.5a, Screen photos of Match Racer., page 389. (Copyright@ 1981 by Gebelli Software. Inc.). Photo 9.7, Screen photos of Caverns of Mars., page 390. 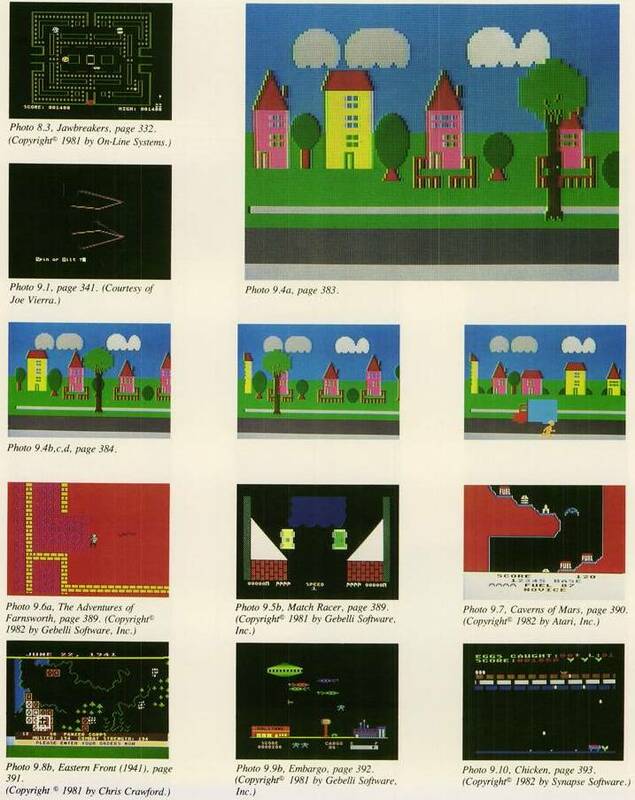 (Copyright@ 1982 by Atari, Inc.). Photo 9.8b, Screen photos of Eastern Front (1941)., page 391. (Copyright@ 1981 by Chris Crawford.). Photo 9.9b, Screen photos of Embargo., page 392. (Copyright@ 1981 by Gebelli Software. Inc.). Photo 9.10, Screen photos of Chicken., page 393. (Copyright@ 1982 by Synapse Software.). Photo 9.4a, Screen photos of the Great Movie Cartoon., page 383. Photo 9.4b, Screen photos of the Great Movie Cartoon., page 384. Photo 9.4c, Screen photos of the Great Movie Cartoon., page 384. Photo 9.4d, Screen photos of the Great Movie Cartoon., page 384.